Lee Si-won is a South Korean actress. Not only excellent in acting, the actress has also been famous as a Seoul National University alumnus. Wanna know more about her? Here’s her profile! Lee’s family consists of her parents and one brother. Her father is a businessman and an inventor. Because of his influences, Lee had become interested in inventing something and making a business out of it. In the tvN talkshow Problematic Man, she revealed that her father is the former chairman of Mensa Korea, a group for those with a high IQ. In the same show, she also surprised other cast because she can answer the reason Leonardo Da Vinci’s painting, the Last Supper, was finished in 2 years and 9 months. After she made an appearance on the show, people started digging more information about his educational background. 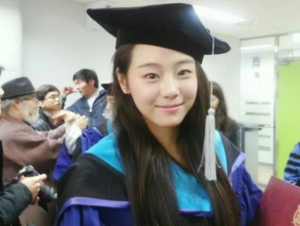 It was revealed that she graduated from Seoul National University (SNU) for a bachelor and master program. Lee started gaining the nickname of “The Brain Actress”. It seems like smart genes run in her family. Her brother also graduated from SNU. In her days as a student, she won first prize and awards in various subjects, such as science and art. Before dreaming of becoming an actress, she used want to be a painter. But, people around her give her advice to make a realistic choice and choose to study business administration. However, she lost interest within the first year of her studies. Then, she started to join theater club and made her debut in the drama The Great King. Lee’s parents objections were severe because she was supposed to study abroad after finishing her masters. Lee had met with Super Junior’ member, Kang-in, during the Mnet’s program, Band of Brothers, in Seoul National University. Lee had the nickname “Queen Bee” in college. The reason behind her nickname is because she befriended many male students in her apartment and they follow her everywhere. Lee had attended Seoul National University in 2009 as one of the top 100 graduates of Seoul National University.